Oddly enough, one of my more popular posts was about…a wine bottle. Earlier in the year I posted about a “peel-off” label that caught my attention. Rosenblum Cellars implemented the label into their bottle design. For a better description, check out my original post. My wife and I thought this was a great idea as we’re always wishing we’d saved something to remind us of good wines we’ve tried. 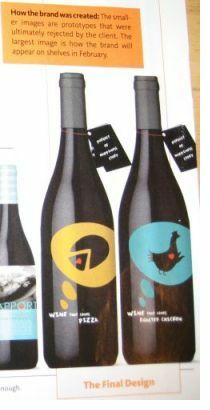 I was reading Brand Week recently and came across an interesting article about wine bottles and how they are evolving. The article focuses on the Amazing Food Wine Co. of New York and their efforts to take the guesswork out of pairing food with wine. I could not find a decent picture of the final design so I took a picture of the magazine article picture (shown below). It didn’t come out too well, but you get the idea. Wine with Chicken and Wine with Pizza are the titles – creating a whole new wine buying experience. One reason I like this continuing story is because it reflects the small business marketers efforts to connect with a moving target – their audience and customers. The audience for wine makers has changed and evolved. It’s not only the wealthy consuming fine wines. There is a broader base of customers for wine makers and many more age groups to which they need to target. Marketers in all industries face this challenge. What fun would marketing be if the same message and same methods for delivering that message were always the same? Our target markets change and evolve and it’s our job to find ways to figure out how to get back in touch with them. The wine market is learning – how are you doing? I’m working on an interview with the Director of Marketing from Rosenblum Cellars. I’m hoping he’ll be able to shed some light on the topic of today’s wine bottle marketing.